For other uses, see Sultana (disambiguation). Sultana at Helena, Arkansas on April 26, 1865, a day before her destruction. A crowd of paroled prisoners covers her decks. Fate: Exploded and sank, April 27, 1865, on Mississippi River seven miles north of Memphis, Tennessee. Passengers who survived the initial explosion had to risk their lives in the icy spring runoff of the Mississippi or burn with the boat. Many died of drowning or hypothermia. Some survivors were plucked from the tops of semi-submerged trees along the Arkansas shore. Bodies of victims continued to be found downriver for months, some as far as Vicksburg. Many bodies were never recovered. Most of Sultana's officers, including Captain Mason, were among those who perished. About 760 survivors were transported to hospitals in Memphis. Fortunately, since Memphis had been captured by Federal forces in 1862 and turned into a supply and recuperation city, there were numerous hospitals in the city with the latest medical equipment and trained personnel. Of the roughly 760 people taken to Memphis hospitals, there were only 31 deaths between April 28 and June 28. Newspaper accounts indicate that the people of Memphis had sympathy for the victims despite the fact that they were an occupied city. The Chicago Opera Troupe, a minstrel group that had traveled upriver on the Sultana before getting off at Memphis, staged a benefit, while the crew of the gunboat Essex raised $1,000. Monuments and historical markers to Sultana and her victims have been erected at Memphis, Tennessee; Muncie, Indiana; Marion, Arkansas; Vicksburg, Mississippi; Cincinnati, Ohio; Knoxville, Tennessee; Hillsdale, Michigan and Mansfield, Ohio. The exact death toll is unknown, although the most recent evidence indicates 1,168, lower than the 1,517 deaths attributed to the Titanic disaster on the North Atlantic 47 years later. On May 19, 1865, less than a month after the disaster, Brig. Gen. William Hoffman, Commissary General of Prisoners, who investigated the disaster, reported an overall loss of soldiers, passengers, and crew of 1,238. In February 1867, the Bureau of Military Justice placed the death toll at 1,100. In 1880, the 51st Congress of the United States, in conjunction with the War Department, Pensions and Records Department, reported the loss of life aboard the Sultana as 1,259. The official count by the United States Customs Service was 1,547. In 1880, the War Department, Pensions and Records Department, placed the number of survivors at 931 but the most recent research places the number at 969. Many of the dead were interred at the Memphis National Cemetery. :206 Three victims of the wreck of the Sultana are interred at Elmwood Cemetery in Memphis, Tennessee. The official cause of the Sultana disaster was determined to be mismanagement of water levels in the boiler, exacerbated by the fact that the vessel was severely overcrowded and top heavy. As the steamboat made her way north following the twists and turns of the river, she listed severely to one side then to the other. Her four boilers were interconnected and mounted side-by-side, so that if the boat tipped sideways, water would tend to run out of the highest boiler. With the fires still going against the empty boiler, this created hot spots. When the boat tipped the other way, water rushing back into the empty boiler would hit the hot spots and flash instantly to steam, creating a sudden surge in pressure. This effect of careening could have been minimized by maintaining high water levels in the boilers. The official inquiry found that the boat's boilers exploded due to the combined effects of careening, low water level, and a faulty repair to a leaky boiler made a few days earlier. The most recent investigation into the cause of the disaster by Pat Jennings, Principal Engineer of Harford Steam Boiler Inspection and Insurance Company, which came into existence in 1866 because of the Sultana explosion, has determined that three main factors led to the explosion. No. 1) The type of metal used in the construction of the boilers - Charcoal Hammered No. 1, which tends to become brittle with prolonged heating and cooling. Charcoal Hammered No. 1 was no longer used for the manufacture of boilers after 1879. No. 2) The use of the dirty Mississippi River water to feed the boilers. The dirt tended to settle on the bottom of the boilers or clog between the flues and leave hotspots. No. 3) The design of the boilers. The Sultana had tubular boilers filled with 24 horizontal 5-inch flues. Being so closely packed within the 48-inch diameter boilers tended to cause the muddy sediment to form hot pockets. They were extremely difficult to clean. 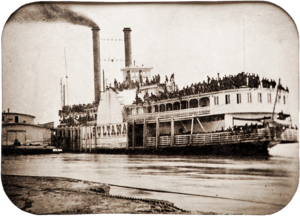 Tubular boilers were pulled from use on steamboats plying the Lower Mississippi after two more steamboat with tubular boilers exploded shortly after the Sultana. In 1888, a St. Louis resident named William Streetor claimed that his former business partner, Robert Louden, made a confession while they were drinking in a saloon of having sabotaged Sultana by a coal torpedo. Louden, a former Confederate agent and saboteur who operated in and around St. Louis, had been responsible for the burning of the steamboat Ruth. (Thomas Edgeworth Courtenay, the inventor of the coal torpedo, was a former resident of St. Louis and was involved in similar acts of sabotage against Union shipping interests. However, Courtenay's gr-gr-grandson, Joseph Thatcher, who wrote a book on Thomas Courtenay and the Coal Torpedo, denies that a coal torpedo was used. "If you read my book... you will note that we do not claim the Sultana, nor did Courtenay.") Still, supporting Louden's claim was the fact that what appeared to be a piece of an artillery shell was recovered from the sunken wreck. Louden's claim is controversial, however, and most scholars support the official explanation. The location of the explosion, from the top rear of the boilers, far away from the fireboxes, tends to indicate that Louden's claim of sabotage of an exploding coal torpedo in the firebox was pure bravado. Two year before William Streeter's claim that Louden sabotaged the Sultana, there was a claim that 2nd Lt. James Worthington Barrett, Co. B, 12th Kentucky Inf., an ex-prisoner and passenger on the steamboat, had caused the explosion. Barrett was a veteran of the War with Mexico and had fought bravely with his regiment until captured at Franklin, TN. He was injured on the Sultana and was honorably discharged in May 1865. There is no reason for him to have blown up the boat, especially with himself on board. Then, in 1903, another person came out with a report that the Sultana had been sabotaged by a Tennessee farmer who lived along the river and cut wood for passing steamboats. After a few Union gunboats filled up their bunkers but refused to pay, the farmer supposedly hollowed out a log, filled it with gunpowder and then left the lethal log on his woodpile. As stated in the 1903 newspaper article, the log was mistakenly taken by the Sultana. Unfortunately for the story, the Sultana was a coal burning boat, not a wood burner. In December 1885, the survivors living in the northern states of Indiana, Michigan, and Ohio began attending annual reunions, forming the National Sultana Survivors' Association. Eventually, the group settled on meeting in the Toledo, Ohio, area. Perhaps inspired by their Northern comrades, a Southern group of survivors, men from Kentucky and Tennessee began meeting in 1889 around Knoxville, Tennessee. Both groups met as close to the April 27 anniversary date as possible, corresponded with each other, and shared the title National Sultana Survivors' Association. By the mid-1920s, only a handful of survivors were able to attend the reunions. In 1929, only two men attended the Southern reunion. The next year, only one man showed up. The last Northern survivor, Private Jordan Barr of the 15th Michigan Volunteer Infantry Regiment, died on May 16, 1938 at age 93. The last of the Southern survivors, and last overall survivor, was Private Charles M. Eldridge of the 3rd Tennessee Cavalry, who died at his home at age 96 on September 8, 1941, more than 76 years after the Sultana disaster. In 1982, a local archaeological expedition, led by Memphis attorney Jerry O. Potter, uncovered what was believed to be the wreckage of Sultana. Blackened wooden deck planks and timbers were found about 32 feet (10 m) under a soybean field on the Arkansas side, about 4 miles (6 km) from Memphis. The Mississippi River has changed course several times since the disaster, leaving the wreck under dry land and far from today's river. The main channel now flows about 2 miles (3 km) east of its 1865 position. In 2015, on the 150th anniversary of the disaster, an interim Sultana Disaster Museum was opened in Marion, Arkansas, the closest town to the buried remains of the steamboat, across the Mississippi River from Memphis. The museum is only temporary until enough funds can be raised to build a permanent museum to the greatest maritime disaster in American history. Featured in the museum are a few relics from the Sultana such as shaker plates from the boat's furnace, furnace bricks, a few pieces of wood, and some small metal pieces. The museum also features many artifacts from the Sultana Survivor's Association, as well as a 14-foot model replica of the boat. One entire wall is decorated with the names of every soldier, crewperson and passenger who was on the boat on April 27, 1865. The J. Mack Gamble Fund of the Sons and Daughters of Pioneer Rivermen and the Association of Sultana Descendants and Friends sponsored a mural by Louisiana artist Robert Dafford and his crew, entitled The Sultana Departs from Vicksburg, as one of the Vicksburg Riverfront Murals. It was dedicated on April 9, 2005. Hendricks, Nancy (2015). Terrible Swift Sword: Long Road to the Sultana. CreateSpace Independent Publishing Platform. ISBN 978-1507764688. Thom, James Alexander (2015). Fire in the Water. Blue River Press. ISBN 978-1935628569. Smith, Joe W. (2010) Sultana! J & M Printing. ISBN 978-931916-64-6. Illustrations by Linda L. Smith. Josh Ritter's song "Monster Ballads" includes several references to the Sultana, including mentions of "Cairo" and "When the boilers blew". A boat with the same name as the Sultana appears in the 1963 Robert Aldrich movie 4 for Texas. It stars Frank Sinatra, Dean Martin, and Ursula Andress. A boat with the same name as the Sultana appears in the first television episode of Yancy Derringer. During the shows in 1958, the Sultana was mentioned as owned by Yancy. ^ Given as the "John Lithoberry Shipyard" on Ohio Historical Marker 18–31 (1999) on the Ohio River at Sawyer Point. ^ a b c d e f g h i j k l m n o p q r s t u Salecker, Gene Eric (1996). Disaster on the Mississippi : the Sultana explosion, April 27, 1865. Annapolis, Md. : Naval Inst. Press. ISBN 1-55750-739-2. ^ The St. Louis Daily Missouri Democrat, April 29, 1865 states that the "steamer Sultana left New Orleans on Friday evening the 21st, with about seventy cabin passengers, and about eighty five employees on the boat." ^ a b June 2016 to July 2018 research by Gene Eric Salecker, Sultana author and historical consultant for the Sultana Disaster Museum, Marion, Arkansas. ^ Potter, Jerry O. "Sultana: A Tragic Postscript to the Civil War". American History Magazine. Archived from the original on 2008-01-28. ^ Bennett, Robert Frank, CDR USCG (March 1976). "A Case of Calculated Mischief". Proceedings: 77–83. ^ a b Harvey, Hank (October 27, 1996). "The Sinking of the Sultana". The Blade. "Section C, pp. 6,3". Retrieved April 27, 2015. ^ "Historic Memphis Elmwood Cemetery". Retrieved 24 September 2015. ^ "Sultana Disaster Monument". Find a Grave. Retrieved 24 September 2015. ^ "Sultana Historic Marker". Arkansas: The Natural State. Arkansas Department of Parks & Tourism. Retrieved 24 September 2015. ^ "Disaster Multiplied". Historical Chronicles Press. Retrieved 2 February 2017. ^ "The Sultana". Historical Marker Database. Retrieved 24 September 2015. ^ "Sultana Monument – Civil War". East Tennessee River Valley GeoTourism Guide. National Geographic. Retrieved 24 September 2015. ^ "Sultana Memorial". Retrieved 24 September 2015. ^ "Sultana Tragedy". Historical Marker Database. Retrieved 24 September 2015. ^ Fold3.com website, The Civil War, Sultana Disaster, April 1865, Quartermaster vessel file relating to the Sultana, page 68. ^ Fold3.com website, The Civil War, Sultana Disaster, April 1865, Quartermaster vessel file relating to the Sultana, page 68-9. ^ Crutchfield, James (2008). It Happened on the Mississippi River. Rowman & Littlefield. p. 109. ISBN 978-0-762-75236-2. ^ Fold3.com website, The Civil War, Sultana Disaster, April 1865, Enlisted Branch file (HAAQ 981 EB 1865, page 80. June 2016 to July 2017 research by Gene Eric Salecker, Sultana author and historical consultant for the Sultana Disaster Museum, Marion, Arkansas. ^ Huffman, Alan (2009). Sultana: Surviving Civil War, Prison, and the Worst Maritime Disaster in American History. Collins. pp. 242–243. ISBN 9780061470547. ^ "The Sultana Disaster (Coal Torpedo theory)". Civil War St Louis. Retrieved 2013-09-08. ^ Tidwell, William A. (1995). "April '65". Kent, Ohio: The Kent State University Press: 52. ^ Rule, G.E. ; Rule, Deb (December 2001). "The Sultana: A case for sabotage". North and South Magazine. 5 (1). ^ National Tribune, (Washington DC), May 20, 1886, p. 3. ^ "The Sultana Departs from Vicksburg". Vicksburg Riverfront Murals. Retrieved 2013-09-08. ^ Huffman, Alan (October 2009). "Surviving the Worst: The Wreck of the Sultana at the End of the American Civil War". Mississippi Historical Society. Retrieved 2011-02-07. ^ Deusner, Stephen. "American Central Dust". Pitchfork Media (Review). Retrieved 31 January 2013. ^ "Blues in the Water, by King's German Legion". King's German Legion. Retrieved 2017-03-10. ^ "Ardent Presents: Cory Branan - "The Wreck of the Sultana"". YouTube. Retrieved 2019-01-12. Bearss, Margie Riddle (Spring 1978). "Messenger of Lincoln Death Herself Doomed". The Lincoln Herald: 49–51. Berry, Chester D. (2005) . Loss of the Sultana and Reminiscences of Survivors. University of Tennessee Press. ISBN 1-57233-372-3. Bryant, William O. (1990). Cahaba Prison and the "Sultana" Disaster. University of Alabama Press. ISBN 0-8173-0468-1. Elliott, Joseph Taylor. (1913). The Sultana Disaster. E.J. Hecker. Indiana Historical Society Publications, v. 5, no. 3. Hendricks, Nancy (2015). Terrible Swift Sword: Long Road to the Sultana. ISBN 978-1-5077-6468-8. Huffman, Alan (2009). Sultana: Surviving the Civil War, Prison, and the Worst Maritime Disaster in American History. Collins. ISBN 0-06-147054-6. Potter, Jerry O. (1992). The Sultana Tragedy: America's Greatest Maritime Disaster. Pelican Publishing. ISBN 0-88289-861-2. Rule, G. E.; Rule, Deb. "The Sultana: A case for sabotage". North and South Magazine. 5 (1). Salecker, Gene Eric (1996). Disaster on the Mississippi: the Sultana Explosion, April 27, 1865. Naval Institute Press. ISBN 1-55750-739-2. Salecker, Gene Eric (May 2002). "A Tremendous Tumult and Uproar". America's Civil War. 15 (26). ISSN 1046-2899. Walker, Sally M. (2017). Sinking the Sultana: A Civil War Story of Imprisonment, Greed, and a Doomed Journey Home. Candlewick. ISBN 978-0-7636-7755-8. Wikimedia Commons has media related to Sultana (ship, 1863). "Sultana: Titanic of the Mississippi – Investigation with several videos". Sultana Disaster Records – Records relating to the explosion of the steamer Sultana, including lists of those aboard the boat. This page was last edited on 13 April 2019, at 10:40 (UTC).